Nilgiri Mountain Rail @ Ooty Toy train is one of the most exciting ways to explore the beautiful Nilgiri Hills and is one of the steepest in Asia, even steeper than its Himalayan counterparts. Niligiri Mountain Railways took about 45 years to complete. This may not sound like much until you realize Darjeeling Hill Railway which was the first Hill railway in India and a predecessor to the Niligiri Mountain Rail was built in a record time of under 3 years. This Metre Gauge Mountain Rail trip is now called the Heritage train. 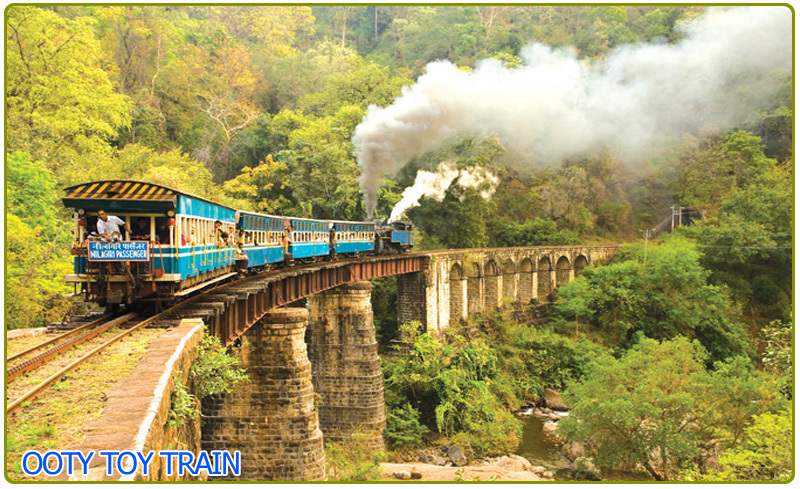 Ooty toy train has rightly been declared as a ‘World heritage site’ by the UNESCO site in 2005. The history of the train goes back to the 18th century when Udhagamandalam or Ootacamund was a favored hill station by the Britishers posted in the south and the access was primarily through horse back or on 'dollies' carried by the workers. this gave birth to the idea of a Hill trains and took almost 45 years for it come into fruition. The difficult task was accomplished by a Swiss Inventor, Riggenback who built the railway line was commenced for operations in the year 1899 upto coonor and was later extended to Fern Hill and then to Ooty in 1900's. The locomotives used in here have impressive strength and life span. The youngest locomotive of this train is about 50 years old and the oldest is about 80 years and still going strong. The most unique thing about the Ooty toy train is that it ascends from an altitude of 1069 Feet to 7228 feet, i,e an impressive 6159 feet, which is the steepest in asia. The excellent engineering capabilities that made this possible is very interesting and unique called Alternate Biting system or ABT, which is also known as rack and pinion system, which mimicks the way a person would climb a ladder. Instead of the engine pulling the train on level lines, there are two rack bars out of steps with each other between the rail lines. On these racks, the pinions climb in the same way that a person climbs a ladder. The engine, while going upwards, is on the backside to push the train from behind. On the other hand, it is on the front side on the return journey downhill, so as to prevent any collision or derailing, this structure also provides excellent stability to the train. The railway line between Mettupalayam and Ooty is about 46 Km long and takes about 5 hours. starting from the Foothills at the Mettupalayam, on the banks of Bhavani river, the train passes through the plains for a few Km's. In the next 12 Km stretch it quickly climbs an impressive 4363 feet, and passes through nine tunnels. The entire stretch between Kallar and Ooty contains around 16 tunnels with different curvatures and lengths and all in excellent condition. The stretch also has about 250 bridges larger and smaller. It is needless to say indeed, what a delight it would be to cruise through this in cute little toy train, which travels at a maximum permissable speed of 13 Kmph in the most beautiful Ghat sections and at a maximum of 30 Km in the other, called Non- Rack in the railway term. Although, there are no scheduled downtimes for monsoon, unlike the Matheran Hill Railway, the train route for the Nilgiri Hill Railway between Metuppalayam and Ooty receives very heavy rainfall both during South West and north East monsoons and the train service may be temporarily suspended due to landslide or related hazards due to the rainfall. (1) Grab the left side of the coach in the journey up and right side in the journey down so as to get the maximum of the valley views. (2) The best views are in the early morning and early evening trains with the pitstops providing ample Photo Ops. (3) Mettupalayam – Coonor section not only has some beautiful views, this part of the journey is powered by Swiss Made X Class Engine, which is one of the earliest oldest loco engine running. (4) The First Class coaches are less crowded but the general or second class coaches offer better views than the first class coaches. (6) The station is officially called Udhagamandalam, although the tongue twisted britishers made it Ootacamund, which became Ooty. The new short name stuck and is more popular locally now. (1) Over enthusiastic travellers end up crowding and may obstruct views of the valley if you haven’t got the window seat on the valley side.